The Massachusetts Institute of Technology (MIT) is a private, coeducational research university located in Cambridge, Massachusetts. MIT has five schools and one college, comprising 32 academic departments, with a strong emphasis on scientific and technological research. MIT was chartered in 1861 and became a Land-grant university in 1863. MIT has numerous research centers and laboratories, including a nuclear reactor, linear accelerator, space research center, artificial intelligence laboratory, and a center for cognitive science. In addition to its extensive library system it also houses several museums. MIT is one of the foremost centers of science in the United States and the world, producing leaders in all aspects of science and technology with strong relationships in academia, government, and industry. It also continues a complementary relationship with neighboring Harvard University, which maintains the highest quality of academic scholarship, focusing on intellectual training with an emphasis on critical thinking, quite different from MIT's approach of "learning by doing" and the importance of useful knowledge. Although Harvard made several unsuccessful attempts to merge the institutions, their separate but cooperative existence has proved beneficial to both. 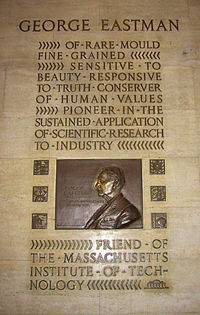 MIT was founded by William Barton Rogers in 1861 in response to the increasing industrialization of the United States. Although based upon German and French polytechnic models of an institute of technology, MIT's founding philosophy of "learning by doing" made it an early pioneer in the use of laboratory instruction, undergraduate research, and progressive architectural styles. 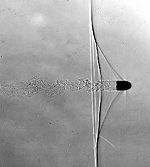 As a federally funded research and development center during World War II, MIT scientists developed defense-related technologies that would later become integral to computers, radar, and inertial guidance. After the war, MIT's reputation expanded beyond its core competencies in science and engineering into the social sciences including economics, linguistics, political science, and management. MIT's endowment and annual research expenditures are among the largest of any American university. MIT graduates and faculty are noted for their technical acumen (64 Nobel Laureates, 47 National Medal of Science recipients, and 29 MacArthur Fellows), entrepreneurial spirit (a 1997 report claimed that the aggregated revenues of companies founded by MIT affiliates would make it the twenty-fourth largest economy in the world), and irreverence (the popular practice of constructing elaborate pranks, or hacking, often has anti-authoritarian overtones). The Rogers Building, Boston, in existence from 1866 to 1938, the first building on MIT campus. A plaque of George Eastman, founder of Kodak, in Building 6. His nose is rubbed by students for good luck. In 1861, The Commonwealth of Massachusetts approved a charter for the incorporation of the "Massachusetts Institute of Technology and Boston Society of Natural History" submitted by William Barton Rogers. Rogers sought to establish a new form of higher education to address the challenges posed by rapid advances in science and technology during the mid-nineteenth century with which classic institutions were ill-prepared to deal. The Rogers Plan, as it came to be known, was rooted in three principles: the educational value of useful knowledge, the necessity of “learning by doing,” and integrating a professional and liberal arts education at the undergraduate level. Because open conflict in the Civil War broke out only a few months later, MIT's first classes were held in rented space at the Mercantile Building in downtown Boston in 1865. Construction of the first MIT buildings was completed in Boston's Back Bay in 1866 and MIT would be known as "Boston Tech." During the next half-century, the focus of the science and engineering curriculum drifted towards vocational concerns instead of theoretical programs. Charles William Eliot, the president of Harvard University, repeatedly attempted to merge MIT with Harvard's Lawrence Scientific School over his 30-year tenure: overtures were made as early as 1870, with several other proposals all ultimately being defeated. The attempted mergers occurred in parallel with MIT's continued expansion beyond the classroom and laboratory space permitted by its Boston campus. President Richard Maclaurin sought to move the campus to a new location when he took office in 1909. An anonymous donor, later revealed to be George Eastman, donated the funds to build a new campus along a mile-long tract of swamp and industrial land on the Cambridge side of the Charles River. 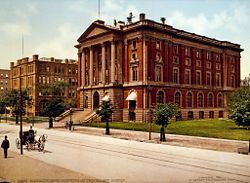 In 1916, MIT moved into its handsome new neoclassical campus designed by the noted architect William W. Bosworth which it occupies to this date. The new campus triggered some changes in the stagnating undergraduate curriculum, but in the 1930s President Karl Taylor Compton and Vice-President (effectively Provost) Vannevar Bush drastically reformed the curriculum by re-emphasizing the importance of "pure" sciences like physics and chemistry and reducing the work required in shops and drafting. Despite the difficulties of the Great Depression, the reforms "renewed confidence in the ability of the Institute to develop leadership in science as well as in engineering." 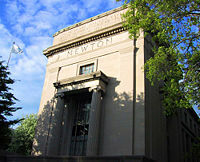 The expansion and reforms thus cemented MIT's academic reputation on the eve of World War II by attracting scientists and researchers who would later make significant contributions in the Radiation Laboratory, Instrumentation Laboratory, and other defense-related research programs. MIT was drastically changed by its involvement in military research during World War II. Bush was appointed head of the enormous Office of Scientific Research and Development and directed funding to only a select group of universities, including MIT. During the war and in the post-war years, this government-sponsored research contributed to a fantastic growth in the size of the Institute's research staff and physical plant as well as placing an increased emphasis on graduate education. As the Cold War and Space Race intensified and concerns about the technology gap between the U.S. and the Soviet Union grew more pervasive throughout the 1950s and 1960s, MIT's involvement in the military-industrial complex was a source of pride on campus. However, by the late 1960s and early 1970s, intense protests by student and faculty activists (an era now known as "the troubles") against the Vietnam War and MIT's defense research required that the MIT administration to divest itself from what would become the Charles Stark Draper Laboratory and move all classified research off-campus to the Lincoln Laboratory facility. MIT's 168-acre (0.7 km²) Cambridge campus spans approximately a mile of the Charles River front. The campus is divided roughly in half by Massachusetts Avenue, with most dormitories and student life facilities to the west and most academic buildings to the east. The bridge closest to MIT is the Harvard Bridge, which is marked off in the fanciful unit – the Smoot. The Kendall MBTA Red Line station is located on the far northeastern edge of the campus in Kendall Square. The Cambridge neighborhoods surrounding MIT are a mixture of high tech companies occupying both modern office and rehabilitated industrial buildings as well as socio-economically diverse residential neighborhoods. Northward view of MIT's campus along the Charles River. Undergraduate dormitories MacGregor House, Burton-Connor House, Baker House, and McCormick Hall, as well as graduate dormitory Ashdown House, can be seen to the west of the Harvard Bridge and Massachusetts Avenue. The Maclaurin buildings and Killian Court can be seen at the center of the image. The Green Building, Walker Memorial, Media Lab, and high-rise offices and laboratories in Kendall Square can be seen to the east. The Infinite Corridor is the primary passageway through campus. MIT buildings all have a number (or a number and a letter) designation and most also have a name. Typically, academic and office buildings are referred to only by number while residence halls are referred to by name. The organization of building numbers roughly corresponds to the order in which the buildings were built and their location relative (north, west, and east) to the original, center cluster of Maclaurin buildings. Many are connected above ground as well as through an extensive network of underground tunnels, providing protection from the Cambridge weather. MIT also owns commercial real estate and research facilities throughout Cambridge and the greater Boston area. MIT's on-campus nuclear reactor is the second largest university-based nuclear reactor in the United States. The high visibility of the reactor's containment building in a densely populated area has caused some controversy, but MIT maintains that it is well-secured. Other notable campus facilities include a pressurized wind tunnel, a towing tank for testing ship and ocean structure designs, and a low-emission cogeneration plant that serves most of the campus electricity and heating requirements. MIT's campus-wide wireless network was completed in the fall of 2005 and consists of nearly 3,000 access points covering 9,400,000 square feet (873,288.6 m²) of campus. As MIT's school of architecture was the first in the United States, it has a history of commissioning progressive, if stylistically inconsistent, buildings. The first buildings constructed on the Cambridge campus, completed in 1916, are known officially as the Maclaurin buildings after Institute president Richard Maclaurin who oversaw their construction. Designed by William Welles Bosworth, these imposing buildings were built of concrete, a first for a non-industrial—much less university—building in the U.S. The utopian City Beautiful movement greatly influenced Bosworth's design which features the Pantheon-esque Great Dome, housing the Barker Engineering Library, which overlooks Killian Court, where annual Commencement exercises are held. The friezes of the limestone-clad buildings around Killian Court are engraved with the names of important scientists and philosophers. 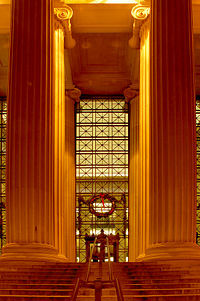 The imposing Building 7 atrium along Massachusetts Avenue is regarded as the entrance to the Infinite Corridor and the rest of the campus. Building 7 (also 77 Massachusetts Avenue) is regarded as the entrance to campus. Alvar Aalto's Baker House (1947), Eero Saarinen's Chapel and Auditorium (1955), and I.M. Pei's Green, Dreyfus, Landau, and Weisner buildings represent high forms of post-war modern architecture. 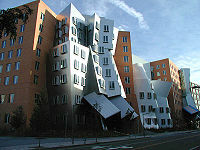 More recent buildings like Frank Gehry's Stata Center (2004), Steven Holl's Simmons Hall (2002), and Charles Correa's Building 46 (2005) are distinctive amongst the Boston area's staid architecture and serve as examples of contemporary campus "starchitecture." 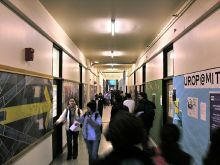 These buildings have not always been popularly accepted; the Princeton Review includes MIT in a list of 20 schools whose campuses are "tiny, unsightly, or both." MIT is "a university polarized around science, engineering, and the arts." MIT has five schools (Science, Engineering, Architecture and Planning, Management, and Humanities, Arts, and Social Sciences) and one college (Whitaker College of Health Sciences and Technology), but no schools of law or medicine. MIT is governed by a 78-member board of trustees known as the MIT Corporation which approve the budget, degrees, and faculty appointments as well as electing the President. MIT's endowment and other financial assets are managed through a subsidiary MIT Investment Management Company (MITIMCo). The chair of each of MIT's 32 academic departments reports to the dean of that department's school, who in turn reports to the Provost under the President. However, faculty committees assert substantial control over many areas of MIT's curriculum, research, student life, and administrative affairs. MIT students refer to both their majors and classes using numbers alone. Majors are numbered in the approximate order of when the department was founded; for example, Civil and Environmental Engineering is Course I, while Nuclear Science & Engineering is Course XXII. Students majoring in Electrical Engineering and Computer Science, the most popular department, collectively identify themselves as "Course VI." MIT students use a combination of the department's course number and the number assigned to the class number to identify their subjects; the course which many American universities would designate as "Physics 101" is, at MIT, simply "8.01." MIT historically pioneered research collaborations between industry and government. Fruitful collaborations with industrialists like Alfred P. Sloan and Thomas Alva Edison led President Compton to establish an Office of Corporate Relations and an Industrial Liaison Program in the 1930s and 1940s that now allows over 600 companies to license research and consult with MIT faculty and researchers. As several MIT leaders served as Presidential scientific advisers since 1940, MIT established a Washington Office in 1991 to continue to lobby for research funding and national science policy. Kismet (robot) was developed to simulate human emotions. MIT has 998 faculty members, of whom 188 are women and 165 are minorities. Faculty are responsible for lecturing classes, advising both graduate and undergraduate students, and sitting on academic committees, as well as conducting original research. Many faculty members also have founded companies, serve as scientific advisers, or sit on the Board of Directors for corporations, and 25 MIT faculty members have won the Nobel Prize. Among current and former faculty members, there are 51 National Medal of Science and Technology recipients, 80 Guggenheim Fellows, 6 Fulbright Scholars, 29 MacArthur Fellows, and 4 Kyoto Prize winners. Faculty members who have made extraordinary contributions to their research field as well as the MIT community are granted appointments as Institute Professors for the remainder of their tenures. For fiscal year 2006, MIT spent $587.5 million on on-campus research. The federal government was the largest source of sponsored research, with the Department of Health and Human Services granting $180.6 million, Department of Defense $86 million, Department of Energy $69.9 million, National Science Foundation $66.7 million, and NASA $32.1 million. MIT employs approximately 3,500 researchers in addition to faculty. In the 2006 academic year, MIT faculty and researchers disclosed 523 inventions, filed 321 patent applications, received 121 patents, and earned $42.3 million in royalties. In electronics, magnetic core memory, radar, single electron transistors, and inertial guidance controls were invented or substantially developed by MIT researchers. Harold Eugene Edgerton was a pioneer in high speed photography. Claude E. Shannon developed much of modern information theory and discovered the application of Boolean logic to digital circuit design theory. In the domain of computer science, MIT faculty and researchers made fundamental contributions to cybernetics, artificial intelligence, computer languages, machine learning, robotics, and public-key cryptography. Richard Stallman founded the GNU Project while at the AI lab (now CSAIL). Professors Hal Abelson and Gerald Jay Sussman wrote the popular Structure and Interpretation of Computer Programs textbook and co-founded the Free Software Foundation with Stallman. Tim Berners-Lee established the W3C at MIT in 1994. David D. Clark made fundamental contributions in developing the Internet. Popular technologies like X Window System, Kerberos, Zephyr, and Hesiod were created for Project Athena in the 1980s. MIT was one of the original collaborators in the development of the Multics operating system, a highly secure predecessor of UNIX. MIT physicists have been instrumental in describing subatomic and quantum phenomena like elementary particles, electroweak force, Bose-Einstein condensates, superconductivity, fractional quantum Hall effect, and asymptotic freedom as well as cosmological phenomena like cosmic inflation. MIT chemists have discovered number syntheses like metathesis, stereoselective oxidation reactions, synthetic self-replicating molecules, and CFC-ozone reactions. Penicillin and Vitamin A were also first synthesized at MIT. MIT biologists have been recognized for their discoveries and advances in RNA, protein synthesis, apoptosis, gene splicing and introns, antibody diversity, reverse transcriptase, oncogenes, phage resistance, and neurophysiology. MIT researchers discovered the genetic bases for Lou Gehrig's disease and Huntington's disease. Eric Lander was one of the principal leaders of the Human Genome Project. MIT economists have contributed to the fields of system dynamics, financial engineering, neo-classical growth models, and welfare economics and developed fundamental financial models like the Modigliani-Miller theorem and Black-Scholes equation. Professors Noam Chomsky and Morris Halle are both noted linguists, Professor Henry Jenkins is prominent in the field of media studies, Professor John Harbison has won a Pulitzer Prize and MacArthur Fellowship for his operatic scores, and former professor Marcia McNutt is one of the world's most influential ocean scientists. In 1969, MIT began the Undergraduate Research Opportunities Program (UROP) to enable undergraduates to collaborate directly with faculty members and researchers. The program, founded by Margaret MacVicar, builds upon the MIT philosophy of "learning by doing." Students obtain research projects, colloquially called "UROPs," through postings on the UROP website or by contacting faculty members directly. Over 2,800 undergraduates, 70 percent of the student body, participate every year for academic credit, pay, or on a volunteer basis. Students often become published, file patent applications, and/or launch start-up companies based upon their experience in UROPs. 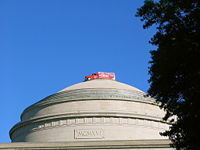 A fire truck was placed on the Great Dome by hackers on September 11, 2006. The traditions and student activities at the Massachusetts Institute of Technology encompasses hundreds of student activities, organizations, and athletics that contribute to MIT's distinct culture. MIT has over 380 recognized student activity groups, including a campus radio station, The Tech student newspaper, the "world's largest open-shelf collection of science fiction" in English, model railroad club, a vibrant folk dance scene, weekly screenings of popular films by the Lecture Series Committee, and an annual entrepreneurship competition. There are also a large number of Performing arts organizations, including a Marching band, Symphony orchestra, Concert band, Musical theater guild, several A cappella singing groups, and various dance groups. MIT's Independent Activities Period is a four-week long "term" offering hundreds of optional classes, lectures, demonstrations, and other activities throughout the month of January between the Fall and Spring semesters. Some of the most popular recurring IAP activities are the robotics competitions, the annual "mystery hunt," and Charm School. MIT students are also famous for engaging in "hacking," which encompasses both the physical exploration of areas that are generally off-limits (such as rooftops and steam tunnels), as well as elaborate practical jokes. Notable hacks have included the theft of Caltech's cannon, reconstructing a Wright Flyer atop the Great Dome, and adorning the John Harvard statue with the Master Chief's Spartan Helmet. The MIT Blackjack Team was a group of students and ex-students from MIT who utilized card-counting techniques and more sophisticated strategies to beat casinos at blackjack. The team and its successors operated from 1979 through the beginning of the twenty-first century. The origin of blackjack play at MIT was a mini-course called 'How to Gamble if You Must', taught in January 1979 at MIT during Independent Activities Period (IAP). A number of MIT students attended this course and then tried out their techniques in casinos in Atlantic City. Despite initial failures, two of them continued the course and, with the help of a Harvard graduate, formed a professional team who went on to make a fortune in Las Vegas. Stories, some true and some fictionalized, about players from the MIT Blackjack Team formed the basis of the New York Times bestsellers, Bringing Down the House and Busting Vegas, written by Ben Mezrich. MIT's student athletics program offers 41 varsity-level sports, the largest program in the nation. They participate in the NCAA's Division III, the New England Women's and Men's Athletic Conference, the New England Football Conference, and NCAA's Division I and Eastern Association of Rowing Colleges (EARC) for crew. They fielded several dominant intercollegiate Tiddlywinks teams through 1980s, winning national and world championships. 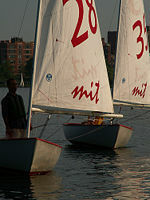 MIT teams have won or placed highly in national championships in pistol, track and field, swimming and diving, cross country, crew, fencing, and water polo. MIT has produced 128 Academic All-Americans, the third largest membership in the country for any division and the highest number of members for Division III. The beaver not only typifies the Tech, but his habits are particularly our own. The beaver is noted for his engineering and mechanical skills and habits of industry. His habits are nocturnal. He does his best work in the dark. A typical "Brass Rat." The design variation pictured is from the Class of 2007. MIT faculty and students value highly meritocracy and technical proficiency. MIT has never awarded an honorary degree nor does it award athletic scholarships, ad eundem degrees, or Latin honors upon graduation. It does, on rare occasions, award honorary professorships; Winston Churchill was so honored in 1949 and Salman Rushdie in 1993. Many MIT students and graduates wear a large, heavy, distinctive class ring known as the "Brass Rat." Originally created in 1929, the ring's official name is the "Standard Technology Ring." The undergraduate ring design (a separate graduate student version exists, as well) varies slightly from year to year to reflect the unique character of the MIT experience for that class, but always features a three-piece design, with the MIT seal and the class year each appearing on a separate face, flanking a large rectangular bezel bearing an image of a beaver. Many of MIT's over 110,000 alumni and alumnae have had considerable success in scientific research, public service, education, and business. Of MIT's alumni, 27 have won the Nobel Prize and 37 have been selected as Rhodes Scholars. Alumni in American politics and public service include Chairman of the Federal Reserve Ben Bernanke, New Hampshire Senator John E. Sununu, U.S. Secretary of Energy Samuel Bodman, MA-1 Representative John Olver, CA-13 Representative Pete Stark. MIT alumni in international politics include British Foreign Minister David Miliband, former U.N. Secretary General Kofi Annan, former Iraqi Deputy Prime Minister Ahmed Chalabi, and former Prime Minister of Israel Benjamin Netanyahu. MIT alumni founded or co-founded many notable companies, such as Intel, McDonnell Douglas, Texas Instruments, 3Com, Qualcomm, Bose, Raytheon, Koch Industries, Rockwell International, Genentech, and Campbell Soup. MIT alumni have also led other prominent institutions of higher education, including the University of California system, Harvard University, Johns Hopkins University, Carnegie Mellon University, Tufts University, Northeastern University, Rensselaer Polytechnic Institute, Tecnológico de Monterrey, and Purdue University. Although not alumni, former Provost Robert A. Brown is President of Boston University, former Provost Mark Wrighton is Chancellor of Washington University in St. Louis, and former Professor David Baltimore was President of Caltech. More than one third of the United States' manned spaceflights have included MIT-educated astronauts, among them Buzz Aldrin (Sc. D XVI '63), more than any university excluding the United States service academies. ↑ Encyclopedia Britannica, 1911, volume 4, 292: "[MIT] was a pioneer in introducing as a feature of its original plans laboratory instruction in physics, mechanics, and mining." ↑ Barton's philosophy for the institute was for "the teaching, not of the manipulations done only in the workshop, but the inculcation of all the scientific principles which form the basis and explanation of them;" The Founding of MIT, cites (1) Letter, William Barton Rogers to Henry Darwin Rogers, March 13, 1846, William Barton Rogers Papers (MC 1), Institute Archives & Special Collections, MIT Libraries. Retrieved May 25, 2008. ↑ Elizabeth Andrews, Nora Murphy, and Tom Rosko. (2004), William Barton Rogers: MIT's Visionary Founder (Charter, laboratory instruction, first classes in Mercantile building) Retrieved May 25, 2008. ↑ An MIT Chronology MIT Institute Archives & Special Collections. Retrieved May 17, 2008. ↑ Power of the NSC Association of Alumni and Alumnae of MIT. Retrieved May 17, 2008. ↑ Report of the Committee on Educational Survey, 13. Retrieved November 6, 2007. ↑ Report of the Committee on Educational Survey, 13. Retrieved May 25, 2008. ↑ Mark Jarzombek. Designing MIT: Bosworth's New Tech. (Boston, MA: Northeastern University Press, 2004), 50-51. ↑ 2007 361 Best College Rankings: Quality of Life: Campus Is Tiny, Unsightly, or Both." Princeton Review 2006 accessdate 2006-10-09 It should be noted in this regard that the size of the campus is considerable. ↑ The Harvard-MIT Division of Health Sciences and Technonolgy (HST) offers joint MD, MD-PhD, or Medical Engineering degrees in collaboration with Harvard Medical School. ↑ MIT Corporation. Retrieved 2007-03-18. ↑ A Brief History and Workings of the Corporation. Retrieved 2006-11-02. ↑ MIT Investment Management Company. Retrieved 2007-01-08. ↑ Rafael L. Bras (2004-2005). Reports to the President, Report of the Chair of the Faculty. Retrieved 2006-12-01. ↑ MIT Education. Retrieved 2006-12-03. ↑ Course numbers are traditionally presented in Roman numerals, e.g. Course XVIII for mathematics. Starting in 2002, the Bulletin (MIT's course catalog) started to use Arabic numerals. Usage outside of the Bulletin varies, both Roman and Arabic numerals being used). This section follows the Bulletin's usage. ↑ "MIT for a long time... stood virtually alone as a university that embraced rather than shunned industry." (August 8, 1987) A Survey of New England: A Concentration of Talent. The Economist. ↑ "The war made necessary the formation of new working coalitions... between these technologists and government officials. These changes were especially noteworthy at MIT." Edward B. Roberts (1991). "An Environment for Entrepreneurs", MIT: Shaping the Future. Cambridge, MA: The MIT Press. ↑ MIT ILP - About the ILP. Retrieved 2007-03-17. ↑ Nearly half of all US Presidential science advisors have had ties to the Institute. MIT News Office (May 2, 2001). Retrieved 2007-03-18. ↑ MIT Washington Office. Retrieved 2007-03-18. ↑ 61 MIT-related Nobel Prize winners include faculty, researchers, alumni and staff. Retrieved May 25, 2008. ↑ Shapiro, Fred (1972-04-25). MIT's World Champions pp. 7. The Tech. Retrieved 2006-10-04. ↑ MIT Facts 2007: Athletics and Recreations. Retrieved 2007-02-14. ↑ MIT '93 Brass Rat. Retrieved 2007-03-23. ↑ Daniel C. Stevenson. Rushdie Stuns Audience 26-100. The MIT Tech 113 (61) (1993-11-30): 1. Retrieved May 25, 2008. Stratton, Julius Adams and Loretta H. Mannix. Mind and Hand: The Birth of MIT. The MIT Press, 2005. History of "Massachusetts Institute of Technology"
This page was last modified on 31 August 2018, at 14:55.